Mod Loadouts offer a quick method of moving mods from one character to another without losing track of the moved mods or taking considerable time to re-mod a set of characters for a specific task. General Mod Loadouts are accessed on the Character Mod screen or on an individual character through the Assign Loadout button. Like Squad Management screens, loadouts can be created on numerous tabs to separate different tasks. 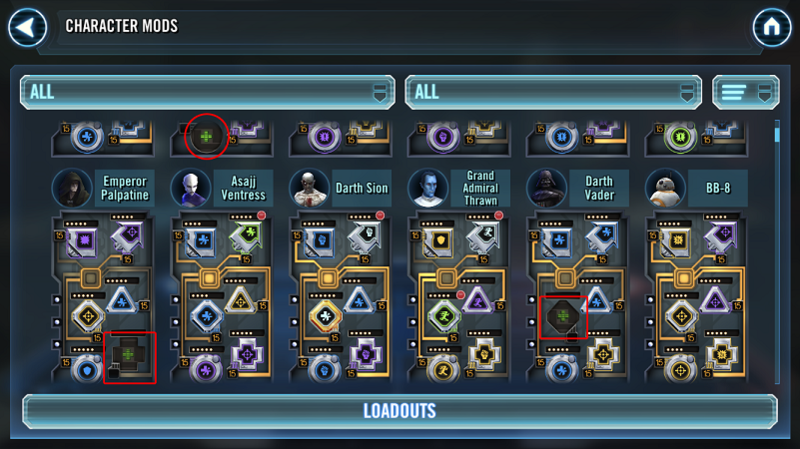 In the below example, there are tabs for the fastest current Arena team and also tabs for quickly re-modding all major characters (Basic Bests), one for Heroic Sith Raid Phase 1, and another Phoenix. There are no appearable limits to the number of tabs that can be created in either Loadouts or Squad Management. Any number of Loadouts can be added to each tab as well, so it is possible to have individual mod loadouts for every character in the game. As mods are moved from character to character using Loadouts, there is a credit cost with each removal, and depending on the amount of credits available, moving mods via Loadouts can become costly quickly. So, the question arises, why bother using Loadouts at all? In an ideal state, players would be able to field “perfect” mods for every character used in any event of the game. Unfortunately, the vast majority of players will only ever be able to create 5 sets of really strong mods to only get used for an Arena team. Arena is not the only place, however, where having the best possible mods is useful. In Territory Battles, for example, the latter Phases are very challenging and the difference between having a G10 Rogue One team that can pass 6 of 6 battles in Phase 6 and failing at 4 or 5 of 6 can be found in just the Speed or the Physical Damage (Offense). Without adjusting mods, players have to settle with a strong Arena team, and mediocre performance in all the other areas of the game. Prior to Mod Loadouts, though, players wishing to field the fastest, strongest teams in every area, would have to keep track of each mod, down to the specific secondaries, and move them to a new character, while also ensuring that the original mods used are both tracked as well. 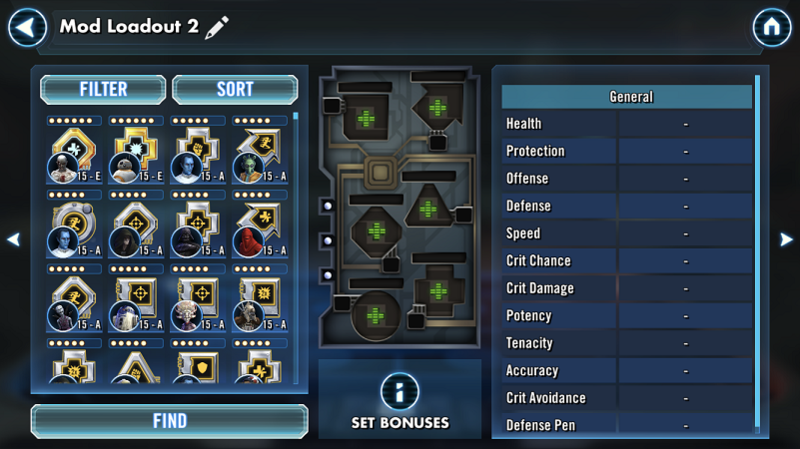 Mod Loadouts make it simple to move a “perfect” set of mods between two different areas of the game. 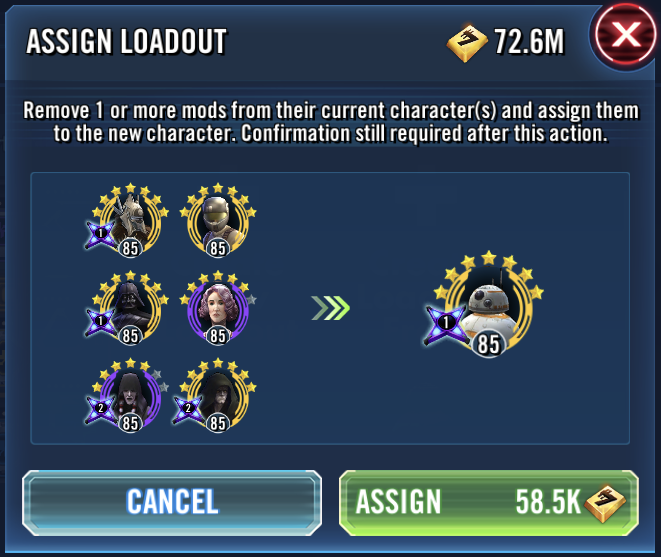 Loadouts can mean the difference between more TB stars, or even a guild’s ability to master Heroic Sith Raid. 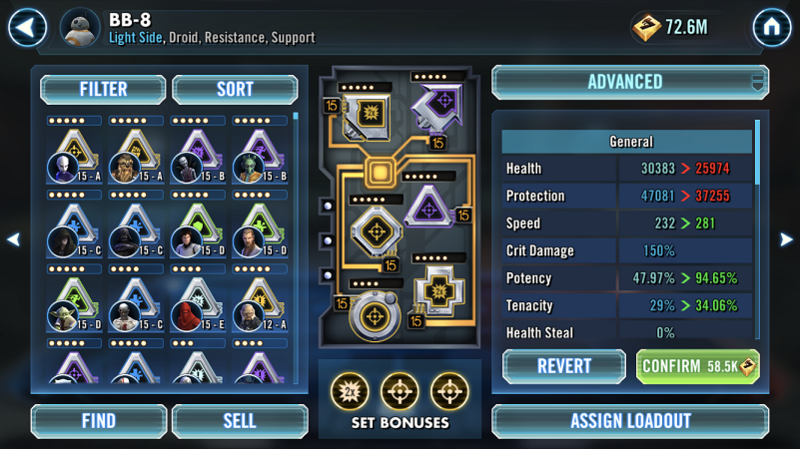 If I am running a Sith faction in Arena, but I want the best performance out of a JTR-Lead Resistance team for Heroic Sith Raid, I’ll want to utilize some or all the mods I use on my Arena team. Rather than go through the painful process of trying to find each mod that is currently placed on Emperor Palpatine or Darth Nihilus and individually placing them on BB-8, for example, I can create a Mod Loadout that pulls mods from Palpatine, Nihilus, and any other member of my Arena team to create a single set of mods that can be placed onto BB-8 just for the raid. 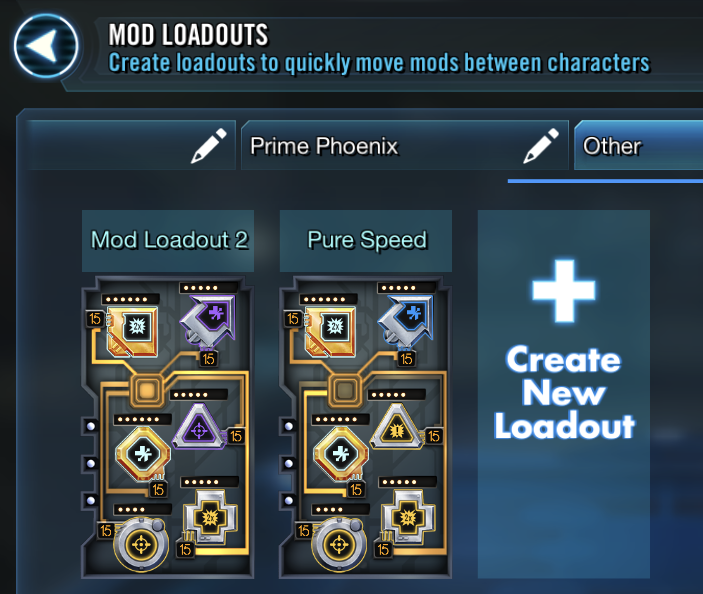 I can also create a set of Arena Mod Loadouts so that once I’ve finished using BB-8 in the raid, I can quickly return all my mods back to my Arena team. Mod Loadouts can be created purely from scratch using the Create New Loadout button, or they can be created by selecting a character, choosing Assign Loadout, and then selecting Create Loadout From. The Create Loadout From will instantly create a new Mod Loadout with all the mods currently on the selected character and will also name the Loadout from the character. 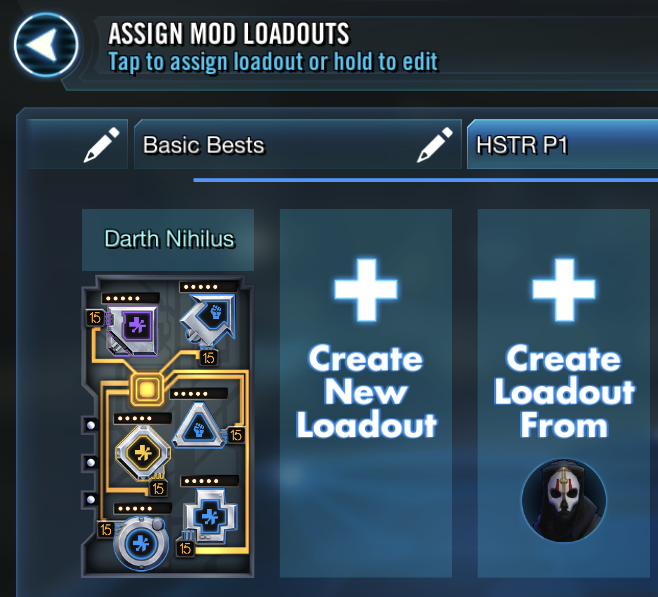 The Create New Loadout button brings up a “blank” mod screen with a generalized name. Any mods can be added as needed. As mods are added, the modded stats will appear on the side. 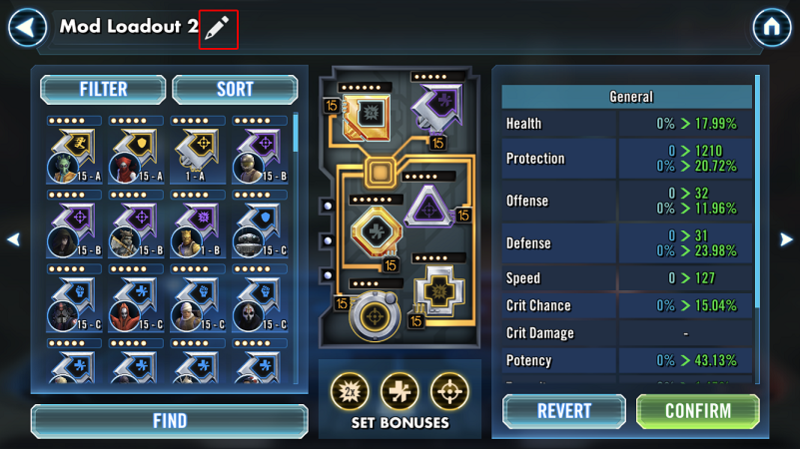 Select the “pencil” icon to rename the mod (no special characters are allowed). The new Loadout will appear under the list of Loadouts under the tab with the Loadout was created. To assign the new loadout, select Assign Loadout on the desired character and choose the loadout desired. There is a cost associated with assigning Mod Loadouts, as with all mod removals. Mod Loadouts lumps all the removal costs together. After selecting the Assign cost, the confirmation screen will show the differences in the original mods versus what the new mods will provide. In this example, BB-8 is losing a fair amount of Health and Protection, but is gaining +49 Speed and tons of Potency, as well as some other stats. Selecting the Confirm button will adjust all the mods and assign new mods to the selected character. 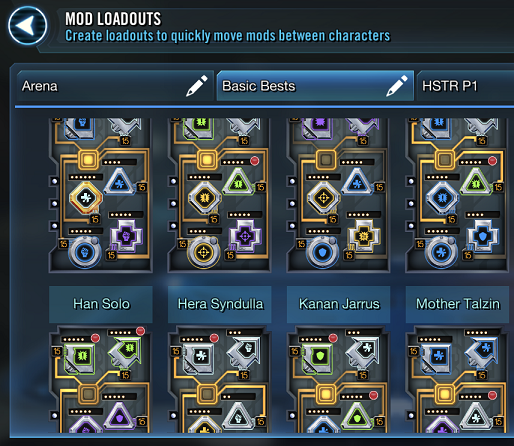 Once the new Loadout has been assigned, any of those mods that were previously on other characters will now show as empty mod slots. 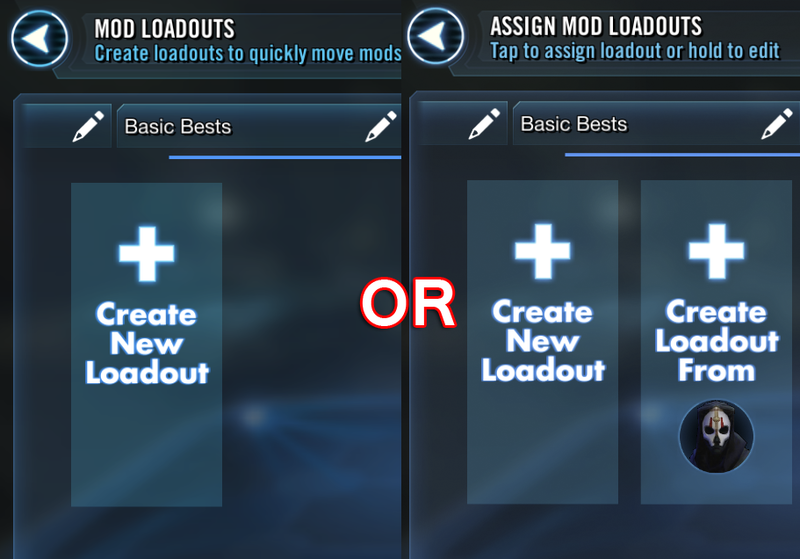 This is why it is helpful to utilize the “Create From” Loadout option so that mods can get added back to the original characters as needed. Note: If you attempt to assign an identical Loadout to a character, the game will give an error message to notify.